Today UN Television reports from all over the world – news footage direct from the latest humanitarian crisis; documentaries putting a human face to crucial issues of our time – human rights, peace and security, and development; live coverage of the UN Security Council as it responds to global crises, and of the annual General Assembly when world leaders gather at the organization’s New York headquarters. 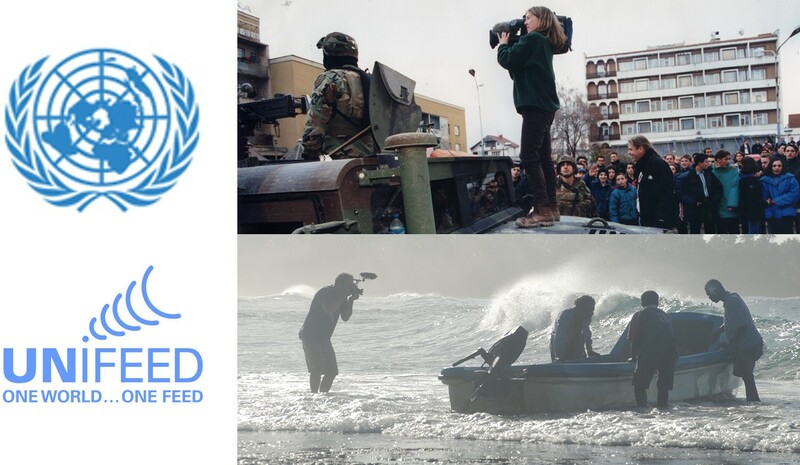 The UN’s TV producers report from locations around the globe – from peacekeeping missions such as South Sudan and Haiti; from political missions in countries like Afghanistan and Colombia; and from the UN’s vast network of operations worldwide. Launched in 1947, UN Television has won numerous awards: an Oscar for a short documentary on people with disabilities; an Emmy nomination for a documentary on Cambodia’s genocide trials; a human rights award for a profile of an act of courage in South Sudan; a prize for an animated feature on the environment that imagines an edible planet. As a specialist in TV Coverage, AMP VISUAL TV provides services throughout the production process for live programmes and those produced under live conditions. It has at its disposal one of the most extensive European fleets of OB vans for filming on location, and around twenty studios in the Paris region. More than 400 employees assist our clients in devising, designing and carrying out filming, transmission and broadcasting of programmes destined for every screen format. Armed with its indisputable 30-year experience in television filming, AMP VISUAL TV has always strived to guide its clients in technological developments. Today, we master all the stages involved in producing programmes that meet consumers' expectations. The 4K Studio of Communication University of China constructed by Sony is located in Building B of No. 2 Teaching Building close to the west gate of the university. Together with the program director room and ancillary facilities, the studio almost occupies most part of this building. Upon signatures of both parties in December 2015, the teams of both parties have jointly completed such an unprecedented large-scale project within the construction period less than one year including winter and summer vacations. The system integration is performed on the 1,400m2 Studio on the basis of eight 4K channels and two HD channels; the studio comprises of 6x 4K Studio cameras HDC-4300 and 2x 4K camcorders PMW-F55 and has the making capacity for high dynamic range (HDR) and wide color gamut (WCG); 2x high-definition studio cameras HDC-2580 utilizing the 2x 4K up-converting function built in a switching platform to make the whole system to achieve the making capacity for ten 4K channels. In order to implement Sky’s new Ultra HD channels – and with a project duration of around 12 months – Qvest Media developed a fully-fledged 4K production environment with a live broadcast chain. In the first stage, the pay TV channel showed one match per Bundesliga matchday, as well as selected games of the UEFA Champions League in ultra-high-definition format on the channels Sky Sport Bundesliga UHD and Sky Sport UHD. In addition to football, other live sport events are intended to be shown in Ultra HD in the future. With almost a million subscribers, YouTube channel Legends of Gaming pits some of the best online gamers in the world against each other in the ultimate e-Sports tournament. For the second year running, channel owner Endemol brought together the greatest players at London’s Alexandra Palace to give fans a chance to get up close and personal with their online heroes. Event specialist Fonix took responsibility for all live production, and technical director, Colin Parnell explains that a relatively simple staging set masked a cutting edge, multilayered video composition that was distributed and displayed on big screens throughout the venue. 1080 media approached the broadcast as though it were for a major broadcaster with 7 camera coverage, commentary and graphics. We realised in testing, the having the scorecard the usual size wouldn’t work on FB and it needed to be high up on the screen due to all of the ‘Likes’ and comments on the lower third of the screen, especially for this watching on mobile phones. To the astonishment of everyone involved in this ground breaking experiment for the sport, over the 4 hour broadcast, 2.2 million unique visitors watched the match. The 38th Vodafone Istanbul Marathon was held with record breaking participation and great excitement. The event was brought on TRT and NTV Sport live by ACTAMEDYA technical co-ordination and infrastructure. An HD wireless broadcast infrastructure of 3 Helicopters, 2 Cineflex cameras and 3 Motorcycle cameras were used. During the 3,5 hours live broadcast, 8 cameras OB Van at the finish in Sultanahmed Square, 5 cameras OB Van at the start on 15 July Martyrs Bridge, another5 cameras OB Van at fun run start on Altunizade Bridge. 4 HD drones were used for close details to be captured, while 8 DSNGs with 2 cameras each were at different locations in the city provided details of 10 and 15 km races. The fifteenth edition of the annual Las Lunas Del Auditorio – the Mexican live performance and music industry's most prestigious awards – was staged at the National Auditorium in Mexico City, a glittering, star-studded event honouring national and international talent with 23 awards and nine dynamic live artist collaborations. It was Tiffy's ninth year of lighting the event which was broadcast live on four National TV channels Télévisa, Azteca, Channel 22 and Canal Once as well as being streamed live on You Tube. To create a spectacular televisual and live experience, Tiffy worked closely with the rest of the FOH team that included video content director and producer Ivan Trujillo and FOH engineer Rudy Gonzales together with the venue’s head of lighting Jorge Rios who operated the large conventional rig on one console, while Tiffy concentrated on the moving lights and other technology on a separate console as well as calling follow spots. Christien Methot served as lighting designer for the World Humanitarian Day Concert at the United Nations in August and used a number of Elation Professional and ADJ dynamic lighting fixtures to light the event. The concert, held August 19 at General Assembly Hall at the United Nations in New York City, starred American actor and singer Leslie Odom Jr., winner of the 2016 Tony Award for Best Actor in a Musical for his portrayal of Aaron Burr in the hit musical Hamilton. Methot is principal lighting designer at Design One Lighting Design, a full service lighting design and consultation firm based in New York City that stocks its own lighting gear. He had worked with production company One Dream Sound the year before on the same project and was asked by One Dream Sound CEO David Ferdinand to help out on this year’s event. In a show unlike any other, Ian Anderson performs a complex rock opera of Jethro Tull, the revolutionary 18th century English agriculturist who also happened to inspire the name of the British progressive rock band. Bandit Lites once again provided the lighting package for the tour which uses an intricate combination of video and live music, as Anderson weaves a tale that features some of his most recognizable works, including “Aqualung” and “Songs from the Woods.” English lighting designer Mark Wheatley crafted a precise harmonization between the lighting and video, as so much of the narrative performance relies on timing. EVS has announced that it has earned an Emmy® Award for Technology and Engineering from The National Academy of Television Arts and Sciences (NATAS). The award recognizes EVS’ groundbreaking work in 4K replay technology and its Epsio Zoom solution. Epsio Zoom gives operators the unprecedented ability to broadcast every detail of live action from multiple cameras, enabling operators to zoom into a particular section of a picture and prepare engaging clips for playout during live events. Whether using UHD-4K cameras or zooming into existing HD SuperMotion content, Epsio Zoom works with all formats and content types, allowing operators to create dynamic replays at high frame rates, freeze key actions, and zoom into critical plays with the highest level of detail. In September, Clear-Com released three new models of LQ devices that had built-in 4-wire audio with GPIO signaling in one connector - which is ideal for linking 2-way radios or audio and trigger signals over a IP network or the internet. The Networked Control Events feature within LQ devices is a flexible way to move control signals across a single channel over the IP network. Users can connect cue lights together with LQ devices and be triggered at one or multiple positions by an On-Air switch from a different end. A stage manager can select the Announcer Key and initiate a call alert to a set of intercom devices and/or radios that are connected to other LQ devices. These scenarios can be easily achieved using IP-linked LQ devices. The Society of Motion Picture and Television Engineers® (SMPTE®), the organization whose standards work has supported a century of technological advances in entertainment technology, today announced that the SMPTE 2016 Annual Technical Conference & Exhibition (SMPTE 2016), held on Oct. 25-27 in Hollywood, California, drew nearly 2,500 registered attendees for a landmark event featuring 72 expert presentations and more than 108 exhibitors spread across two exhibit halls. This year's event culminated with the SMPTE Centennial Gala, a celebration of the Society's 100th birthday. This Autumn, online streaming service Amazon Prime will be introducing its new car show, 'The Grand Tour'. As an expert in the field of 4K, United was asked to take care of technical solutions for the show worldwide. United has built a custom flypack for this assignment, giving the show its first novelty. This mobile set includes a specially developed record rack to process the volume of data in real time. 'The Grand Tour' reunites the trio of presenters: Jeremy Clarkson, Richard Hammond and James May. The Amazon Prime show, currently already the subject of much discussion, is shot in a studio tent that is put up in various exotic locations around the world. Haivision was helping to power the 360-degree virtual reality (VR) 4K live stream for The CMA Awards Mary Kay Fashion Cam – the first live VR experience from The CMA Awards Red Carpet. The live stream was powered by the Nokia Ozo VR camera and Haivision's KB 4K HEVC/H.264 Encoder, and the digital production was managed by Thinkingbox, a leading global creative and digital production studio. Trusted for the highest quality immersive 360 VR internet streaming experiences, Haivision’s KB 4K Encoder featured HEVC to deliver the highest resolution video to global internet audiences. Panasonic’s legacy of use in natural history cinematography continues as the UK Wildlife Film School adopts the AG-DVX200 to train the next generation of talent. The school teaches students who have a keen interest in natural history production and prepares them to meet the challenges of shooting out on location by way of practical, hands-on film courses. After various requests from students, the UK Wildlife Film School has adopted 4K technology. Filming out on location, the students have to live entirely self-sufficiently, carrying their equipment by hand.